After a winter of extremes, it’s reassuring to see the return of spring as it takes hold across the land. The sights and sounds of the season are evident as you as you walk out the front door. 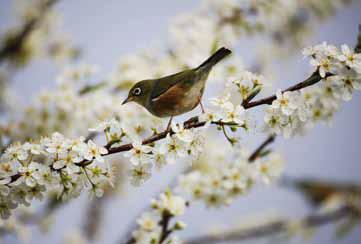 Resident birds have started singing their territorial songs in preparation of the nesting season that’s about to begin. Northern cardinals, song sparrows, pine warblers and American robins are commonly heard across a variety of habitats. Red-winged blackbirds, purple martins, northern parulas and broad-winged hawks are among the vanguard of early migrants to make their return. As spring progresses, they will be joined by later arrivals from the neotropics. Birdwatchers will be searching for feathered jewels like black-throated-green warblers, scarlet tanagers, indigo buntings and the first ruby-throated hummingbirds of the year. At the same time, wintering species will be leaving the Carolinas for their own breeding territories to the north. These are the final days to see common loons, yellow-bellied sapsuckers, dark-eyed juncos and ring-billed gulls. The increase in daylight means the water temperature of Lake James is rising. Each type of fish has its own threshold that must be met to trigger the spawning cycle. Among the first to lay their eggs are walleye (see related story). They will be followed by bluegill, largemouth and smallmouth bass, catfish and carp. The trees and plants are responding to the changing season as well. Vascular plants are poking up through the layer of duff on the forest floor and deciduous trees are sprouting new leaves that seem to expand by the day. Green briars, wild grapes and poison ivy vines are sending out new growth as they climb across the ground and into the trees. Mammals are also on the move. Black bears have emerged from their winter dens and the females have their recently-born cubs in tow. As they seek to replenish themselves after their long winter’s nap, bears will take advantage of all food sources, including human trash. It’s the time of year to remind ourselves to keep trash cans secured and feed pets indoors. It only gets better from here folks. Enjoy the spring and hope to see you out on the trail!